Strategically located to accommodate TO&A attorney clients from Parker, Highlands Ranch, Castle Rock, Littleton, Englewood, and Colorado Springs, the Meridian Center is the answer to your court reporting needs. 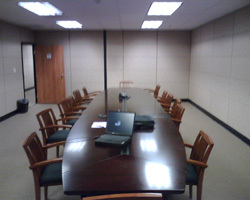 Choose from 2 fully furnished conference/deposition rooms, and five touchdown offices for clients and guests-on-the-go. You can be assured of a smooth court reporting process with our cutting edge technology including LCD projectors and high speed internet access. Our video conferencing studios make communication with colleagues or video depositions a breeze. TO&A experienced administrative, technical and deposition support staff are dedicated to making your job easier.